About Un artesano callejero fabrica ceniceros recortando latas de refresco cerca de Las Ramblas en Barcelona. A street craftsman manufactures ashtrays cutting soda cans near Las Ramblas in Barcelona. 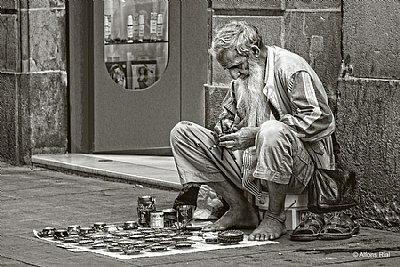 An excellent capture and post work of this street craftsman Alfons. Well done. Very impressive capture Alfons. Hats off to the Gent. for his enginuity.I wish him every success.